Adamson Systems Engineering has become a fixture on the trade fair floors of Prolight + Sound in Frankfurt Germany. This year marked the thirtieth anniversary for Adamson, a milestone for the Canadian company that develops and manufactures a complete line of high performance loudspeaker systems for the professional touring and installation market. In celebration they hosted a series of parties and dinners with close friends and customers in the industry who have shared in their success while at the event. At this year’s event Adamson launched three new products and the full Point Concentric line. Those products include additions to the Energia Series with the e12 line source, and the e218 Sub, the all new A218 and the PC5, PC6, PC8, PC10 and PC12. The popular e15 will now have a partner in the Energia line with the release of the all new e12. 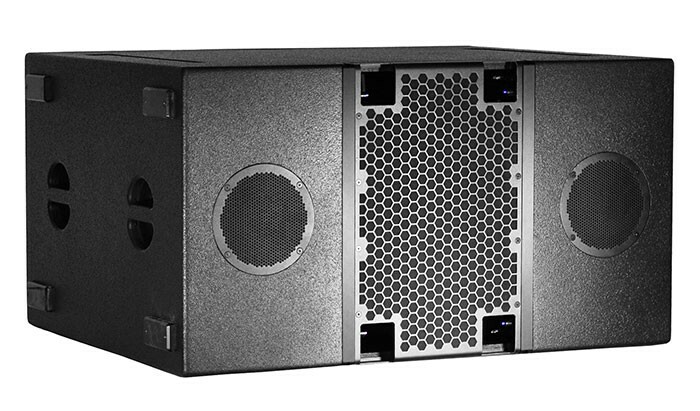 The e12 was designed as a standalone mid-size line array but can also be used as a downfill, or side fill in a larger e15 arena system. It will be a versatile solution for large format touring companies and regional rental companies. The e12 offers extremely high powered vocal performance for its size and because the e12 and e15 share the mid and high components, they create a uniform and seamless ribbon of mid/high energy when the e12 is used in a downfill configuration. Inside the box is Adamson’s new 12" Kevlar driver, the ND12S with advanced cooling and larger xmax, providing uncompromised LF extension, in a 12’ line source system. By utilizing Adamson’s advanced cone architecture, the ND12S has reduced eddy currents and intermodulation distortion by utilizing shorting rings in the motor design. The 12" cone and dustcap are manufactured entirely out of Kevlar creating the most weather resistant low frequency component in the industry. The weight of the e12 makes this box an ideal candidate for venues with point load restrictions or smaller format applications. The e12 is incredibly light weight but that doesn’t mean it lacks power as it harnesses all of the power of the e15 in its slimmer bodied design. The A218 is all purpose workhorse sub that is front loaded with two of Adamson’s new ND18S drivers. The drivers have a dual spider that is coated in Silicone for long term suspension memory. The drivers are equipped with Kevlar cones with Adamson’s signature advanced cone architecture. Shorting rings were integrated to eliminate eddy currents and reduce intermodulation distortion. Cardioid plugs are included on the front of the cabinet to ensure easy cabling in front/back configurations. The Point Concentric Series brings a powerful range of passive, co-axial, loudspeakers designed for both installation and rental markets to the Adamson tool box. The multipurpose cabinets are available in a double 5" (PC5), single 6" (PC6), single 8" (PC8), single 10" (PC10) and a single 12" (PC12) version. This discreet range of cabinets, come coated with water borne acrylic paint, while all metalwork is finished with a Sandtex Powder Coating. Keeping form with the acclaimed Point Series, all cabinets can be color matched to the RAL library. fly points in 4 locations and additional rear Omnimount points. Threaded Pole mount hardware (for mic stand) or barrier strips can be installed, at no charge, on either cabinet by request. The PC5/PC6 cabinets are designed to produce linear, high resolution audio throughout their bandwidth. Regardless of their modest size, both cabinets produce warm mid bass and plenty of punch for their weight class. As a standalone cabinet, under balcony, or stair fill, the versatile PC5 and PC6 cabinets will fit a variety of applications. When a little more power is required, designers and rental companies can step it up and reach for the 8", 10" or 12" option in the Point Concentric Series. The larger members of the family are shipped with standard M10 and Omnimount points, but also offer optional vertical yokes for versatility. Unlike their smaller companions, the PC8/PC10 and PC12 ship with standard pole mount hardware. A unique rotatable jack plate allows for either Neutrik or Barrier Strip connections on the bottom or back of each enclosure. Simply unfasten a few screws and rotate the jack plate to change the termination position. When both power and finesse are needed, the Point Concentric Series offers users a unique solution for high performance audio applications.